I bought this wine at 10 bucks! It was produced by Mercian Corporation: Japanese wine and spirits producer and marketer, as well as pharmaceutical company. Just what I'd expected from Mercian, the wine was mellow and had a fruity aroma. 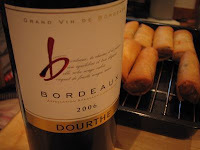 b Bordeaux means the wine is always well balanced as it is retained to seek the best flavor. The word "b" represents royal road of Bordeau. Hope to see you again tomorrow!! !